Explaining what bunions are and why they happen, with specialized conservative and surgical treatment options. A bunion (hallux valgus) is an abnormal angulation of the big toe relative to the foot that is caused by several factors. We don’t know exactly what causes bunions, but we suspect that genetics, shoe choices, and other factors all contribute. Shoes with a small toe box result in an abnormal stress on the metatarsophalangeal joint. If left untreated, this stress can result in a permanent osseous (bony) deformity. What exactly is a Bunion? And why is it called that? When the bone or tissue at the big toe joint moves out of place it forces your big toe to bend toward your other toes, causing a large, often painful lump of bone on the outside of your foot. 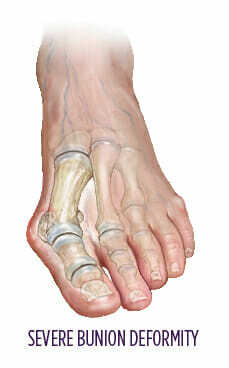 This lump is called a bunion from the Latin word “bunio” meaning enlargement. side of the big toe and result in increased irritation. In order to determine the severity of your bunion, your specialist may take X-rays, ask you questions, and conduct a physical examination. X-ray is useful in viewing the bony anatomy of the foot and can help diagnose the type of bunion deformity. Recognition of a bunion early may allow for footwear modifications and counseling that adequately address the symptoms. Your specialist may prescribe a special type of pad and show you how to tape your toe in the correct position. Proper footwear is also essential to managing the problem. Continuing to wear poorly fitting shoes, high heels, or shoes with a narrow toe box may exacerbate the problem. These simple changes may be enough to manage the symptoms from the bunion deformity. But in certain cases, surgery is required. The type of surgery performed is dependent on the underlying cause of the bunion. Even though bunions look similar in nature, there are actually various types of bunions with multiple surgical corrections and recovery instructions. When appropriate, your specialist will describe the details of the procedure with you and discuss his or her expectations for your recovery. The recovery process can vary significantly based on the severity of the bunion and the type of surgery required to correct it.